Time for that Sunday catchup! First, another friendly reminder that the May sale is still on! 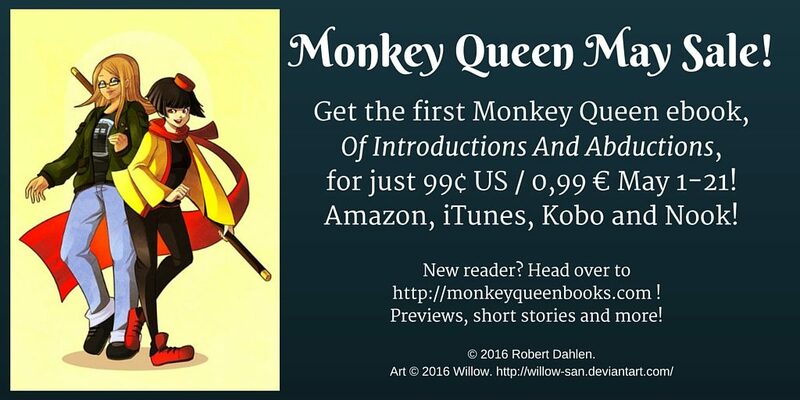 The first Monkey Queen ebook, Of Introductions And Abductions, is just 99 cents US/CA/AU, £0.99, and €0,99 now through May 21! For buying links, scroll up to the top of the page; you can also click “Where To Buy”, or search Amazon or iTunes. More after the cut! It’s our last Sunday catchup before the New Year’s! I wanted to take a moment to thank all of Michiko and Beth’s fans, casual or die-hard, those who are just discovering the Monkey Queen and those who have been with us from the start. Thank you! If you’re not busy New Year’s Eve and New Year’s Day, check back here; there may be a surprise or two for you! Forgive me for starting the Sunday catchup with a blatant plug, but I know a lot of you have been distracted between a certain holiday and a certain movie. So, if you missed it – Redblade, the fifth Monkey Queen book, is out now! This post has all the links to buy it at Amazon stores worldwide (and it’s free to read for Kindle Unlimited members or Amazon Prime members with Kindles)! And this post is where you can preview the first two chapters! And while I have your attention, the first Monkey Queen book, Of Introductions And Abductions, is still on sale for 99 cents US, and will stay on sale through New Year’s weekend! Grab it now if you haven’t read it, and remember that ebooks make great gifts!